The term “cockroach” is often used to describe dual-sport or strictly off-road bikes that are designed to take a beating, and the bikes of the Dakar Rally taking place in South America this year fit that description in the purest form. These bikes are not models you buy off the showroom floor, but rather finely tuned masterworks of the factories that provide them. The 450 is the maximum cubic centimeters allowed in an engine, which can be either single or twin-cylinder design. KTM is the New York Yankees or New England Patriots of the Dakar Rally, except with more recent wins. “More” is an understatement, though, and “all” is a more appropriate term, with the KTM factory taking the bike class win every year since 2001. They won with a 950cc bike, five 660’s, three 690’s, and with current restrictions limiting bikes to 450cc, KTM has six straight wins. 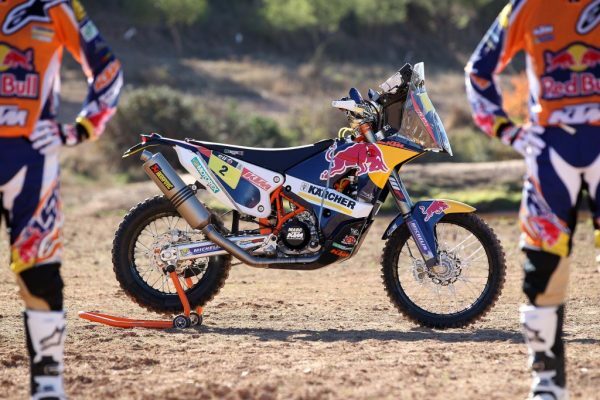 The KTM 450 Rally Replica features a single cylinder liquid-cooled DOHC 450cc engine, fuel-injection and a reworked rear suspension. A slimmer design helps with control and an ergonomic seat provides comfort in the bitter end of a long round. The rider can select the fuel source, one of two tanks on the front and back, to help with weight distribution. 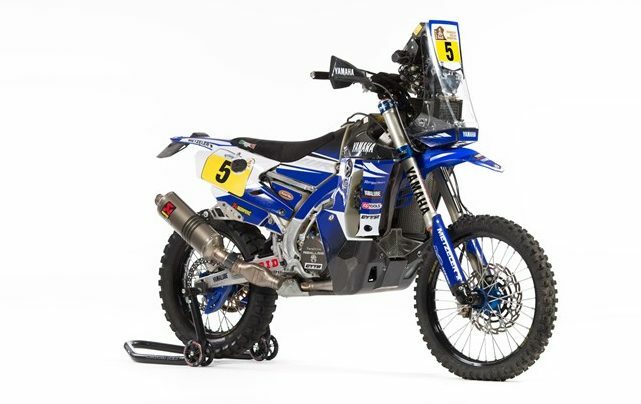 Yamaha Factory Racing’s WR450F Rally is based on the company’s enduro WR450F platform, but with focus on minute detail regarding high performance and reliability over extremely long distances (hundreds of miles a day, on rough terrain). Rally performance is increased by a series of EFI fuel maps and an Akrapovic titanium exhaust that sweeps under the engine. Featuring a 25mm offset, the team provided a more neutral riding position by positioning the extra fuel tanks in a place that allows for free and easy movement. The new WR450F Rally combines a set of forks developed by BOS Suspension with a KYB Factory rear shock. 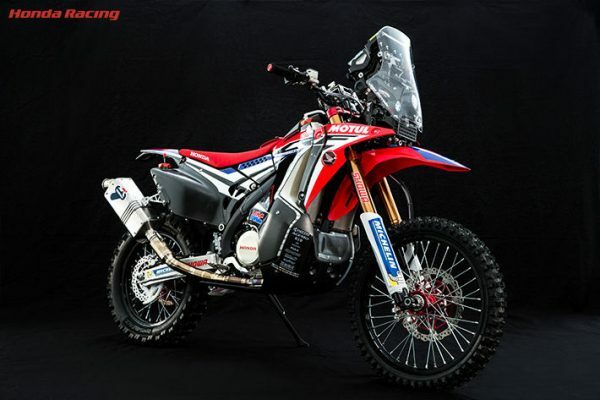 An oversize 300mm front disk allows for easier braking under heavy load at high speeds..
Honda Racing Corporation developed a new approach to testing and development immediately after last year’s Dakar Rally. Competing in rallies in China, Argentina Morocco and more, they sought out direct feedback from riders right after they finished the race. This would result in fresh-minded suggestions that wouldn’t have come up before the rally. The riders would try each other’s bikes and give advice on individual components that may need changing. The result is the 2017 CRF450 Rally. A liquid-cooled single cylinder DOHC 450cc powers the bike, and a PGM-FI fuel injection system keeps the bike running even in severe environmental conditions. 33.7 liters of total fuel capacity keeps it running for rally distance. For the third year of participation for the Sherco TVS team, the team fields the 2016 RTR 450. Sherco specializes in making dirt and trail bikes, so the Dakar is a natural fit. The RTR 450 carries two fuel tanks, one up front and one at the back, which helps ease weight distribution. Akrapovic exhaust headers and titanium mufflers aid in the fuel expulsion process, and a six-speed sequential gearbox and a low weight of around 135 kg keep the bike smoothly floating over the rough terrain of Argentina, Paraguay and Bolivia. 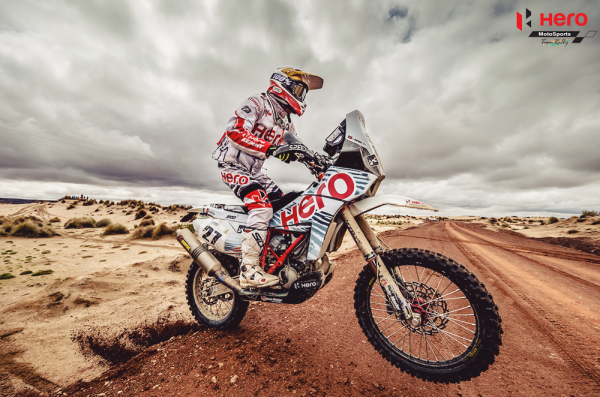 This year Hero MotoCorp has joined forces with Speedbrain, former helpers to Team Husqvarna, to tackle the task of Dakar 2017. The Speedbrain 450 produces 50 bhp and comes in at 170kg. A chromium-molybdenum steel frame provides durability without increasing the weight of the structure. A liquid and oil-cooled single cylinder DOHC 450cc engine is in line with the competition, but its claimed 12,000rpm rev limit sets it apart from the field. Suspension is made up of 52mm cone valve front forks with steering damper and a Trax rear shock with full linkage. The suspension travel of 300mm to the front wheel and 320mm to the rear sets it apart from any bike available on the market. Hero MotoCorp is the world’s largest two-wheeler manufacturer, with 6.63 million sold in 30 countries last year. For all your up-to-date needs from the race visit Dakar.com.